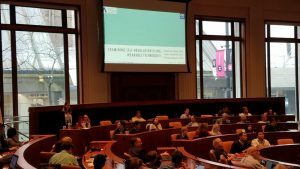 Last month, I had the pleasure of attending LAK17 (The 7th International Learning Analytics & Knowledge Conference) in Vancouver, British Columbia. This is my third event, having previously gone to LAK15 and LAK16, and it is apparent how the conference and field has continued to evolve. 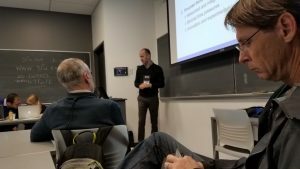 There was one aspect of the field that has been of particular interest to me – the growth in areas of meta issues such as ethics, adoption, and policies, as Xavier Ochoa mentioned in the LAK17 opening remarks. I attended most of these sessions throughout the conference. I am currently working on my doctorate in K-16 Educational Leadership and Policy Studies and have been interested in investigating learning analytics (LA) adoption in a K-16 context. Most of the work presented at the conference focused on higher education, such as the SHEILA project (of which my research lab plays a role), but I was excited to hear about the experiences from a K-12 perspective in the presentation “Strategies for Data and Learning Analytics Informed National Education Policies: the Case of Uruguay.” This is an area that needs much greater exploration and I am glad that the LAK18 organizers have highlighted this gap in the current call for proposals. I enjoyed taking part in two workshops ahead of the event: Building the LA Curriculum and LA Policy: Developing an Institutional Policy for Learning Analytics using the RAPID Outcome Mapping Approach. In the first session, I presented on a forthcoming LA MicroMasters program and the role it can play in graduate curriculum and alternative credentialing (I current work as the program’s project manager). On top of a discussion around LA program development, we worked to identify common areas of course content, sequencing, tools, and resources. In the second workshop, I had the opportunity to learn more about the approach taken in the aforementioned SHEILA project which had its roots in Australia before starting in the EU and United States. I would be interested in working with the SHEILA team on a similar approach to K-12 in the U.S and am curious to see how the unique challenges of K-12 shape LA adoption. I enjoyed the remainder of the conference including each of the keynote speakers. My colleague in the LINK Research Lab, Catherine Spann, presented a study that focused on the use of wearable technology data when researching attention and self-regulation. She did a great job and presented in a very unique room (Wosk Centre for Dialogue). As expected, it was rainy and cool almost the entire time I was in Vancouver, but it was still a lovely venue for the event. 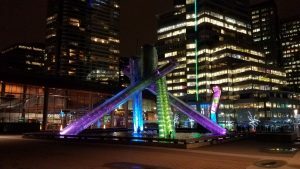 I did not have a lot of time to do some sightseeing, but the rain stopped one evening and I had the opportunity to visit the Olympic torch down by the water (although it was no longer lit). I sincerely hope that I get the opportunity to head up that way in the future to do some hiking. It was great to see some of the LAK regulars and I enjoyed a happy St. Patrick’s Day out with a big group on my final evening in Vancouver. Beyond their impressive academic work, one of the best aspects of the LAK community is their friendliness. 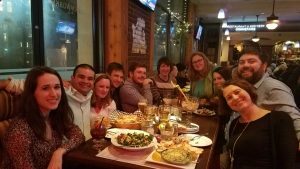 I have sincerely enjoyed making connections with people across the field at these events. 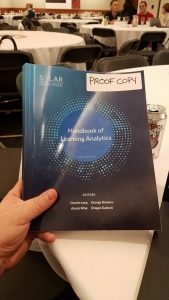 Finally, I was able to bring home an early copy of the Handbook of Learning Analytics for my boss to see (he was part of the team that helped create it). This handbook is now available for free online and I encourage you to check it out. We plan to use this book in our upcoming MicroMasters program and it is filled with quality work in a large number of research areas.